Men and their chicken cordon bleu! Again, I felt I was in new territory, but they turned out great! They were a refreshing change for our table. A fun meal to make with kids! Time to cook is 4 to 6 hours. Makes 4 to 6 servings, depending on how hungry your audience. 6 pieces prosciutto, which I couldn’t pronounce at the meat counter and had to write the name down for the woman behind the counter. Embarrassed! 1. 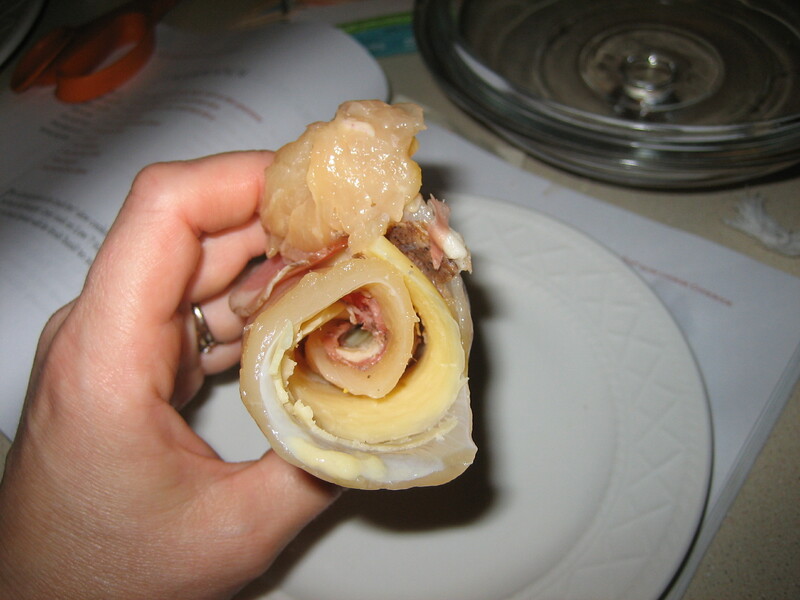 On each chicken breast, place one piece of prosciutto and one piece of cheese, then roll them up and secure everything with a toothpick. 2. Spice them up with a little salt and pepper and have fun positioning them in the crock pot. 3. In a small bowl, whisk together the soup, milk, and white wine and pour it over all the pretty rolls you have. 4. Cover and cook on Low 4 to 6 hours. I used the 3-½ quart slow cooker, so I really had to push those suckers down in the juice, but they still weren’t all covered. Nonetheless, they all turned out juicy and moist. With the mushroom soup, the white wine, the prosciutto and the real Swiss cheese, it tasted extremely rich, like something you’d get in a restaurant. Matt had only tried chicken cordon bleu with ham. He preferred it with the prosciutto, saying it added a hint of cinnamon. I found other interesting ways to make chicken cordon bleu from casseroles to burgers and corn flake crusts, even a cordon bleu pizza, all using different types of cheeses and beautiful pictures. I posted them below my slide show. This one from Hello Paleo about the love of prosciutto I particularly enjoyed! I love Chicken Cordon Bleu. Your recipe looks great and easy. I just have a question. Can I close up the chicken roles to keep the cheese inside, and if so, how would you suggest I do it? I tried something similar with stuffed porkchops and wound up with a mess on my hands. I used one toothpick, but I don’t see why you couldn’t use more. Even on the ends, you could close those up with toothpicks. The cheese will still leak out a little bit, but not as much. I scooped the cheezy mess that did leak out over the rolls when I served them. Give that a shot? MIne weren’t too messy, maybe you’ll have better luck than with the pork chops. Do you still have that recipe? Thanks for the mention! And that looks AMAZING. I’ll have to try it soon… Mmmm! Absolutely! Can you eat cheese? not officially, but one time won’t hurt 🙂 I sometimes eat cheese and yogurt.